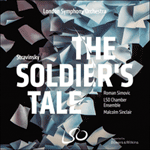 In 1918, some five years after having gained notoriety with his ballet The Rite of Spring, Stravinsky composed a very different yet almost equally seminal work, The soldier’s tale (L'histoire du soldat). Unlike the grandiose orchestral forces required for his earlier revolutionary ballet, the new work was intended for a small group of musicians accompanying a story 'to be read, played and danced' by a few performers. To a large degree the restricted resources were imposed by the economic stringencies of post-First World War Europe, made all the more acute in Stravinsky’s case by the October Revolution and his subsequent loss of what means he had in Russia. Yet those restrictions inspired one of the most inventive and evocative suite of pieces for chamber ensemble ever composed. His collaborator was the Swiss writer and poet Charles-Ferdinand Ramuz, a close friend Stravinsky had made in 1915 shortly after moving his family to Morges by Lake Geneva. Introduced by the conductor Ernest Ansermet, Ramuz and Stravinsky were soon virtually in constant touch; even before The soldier’s tale Ramuz helped prepare the French libretto for Stravinsky’s opera-ballet Renard, as well as translations of several Russian folk texts Stravinsky set in Berceuses du chat and Pribaoutki. It was, it seems, Ramuz’s idea to create a touring semi-dramatic work 'for only a few instruments and only two or three characters', able to be staged on a trestle stage to enable performances even in villages without a theatre, as a relatively lucrative yet inexpensive way of solving their impecunious state. Stravinsky sourced a Russian folk tale, ‘The deserter and the Devil’, from Alexander Afanasiev’s celebrated anthology: this tells of a soldier, returning home on leave, being waylaid by a devil who persuades him to trade his violin for a magic book which promises to provide material wealth. Ramuz instantly recognised the symbolic (not to mention the musical) potential of the Soldier’s violin, and in creating his performing version of this tale (which he ‘universalised’ by relocating the action in the local Vaudois region) he gave the violin an even more central role: whereas in the Afanasiev version the violin was merely the soldier’s incidental means of entertainment, replaced by purchasing another when he loses his first fiddle to the Devil, in Ramuz’s retelling it becomes the violin, which the soldier wins back from the Devil by playing cards, then plays to cure the Princess. Significantly, the soldier’s fortunes collapse each time the violin falls into the Devil’s clutches, and recover when he claims back his instrument: in short, the violin represents the soldier’s soul (as confirmed by Stravinsky himself), so emphasising the Faustian quality of his pact with the Devil. The strikingly earthy music Stravinsky created for the soldier’s violin playing was—the renowned scholar of Russian music, Richard Taruskin, has argued—inspired quite appropriately by gypsy verbunkos-style fiddlers, as traditionally used by Austro-Hungarian recruiting parties to entice young men to join the army. Just as appropriately in a story about an ordinary soldier, Stravinsky included cornet, trombone and drums to accompany the several marches. Just as naturally, too, one may hear the influence of popular music of the time—though here we encounter something of a chicken-and-egg question: how much was The soldier’s tale inspired by jazz, and/or how much did it fortuitously tap into a number of seminal influences which subsequently defined the sound of jazz? Stravinsky later claimed that 'my knowledge of jazz was derived exclusively from copies of sheet music [provided by Ansermet], and—I had never actually heard any of the music performed': yet he was certainly acquainted with ragtime and its various imitations being performed in the American bars of Paris and the music halls which he enjoyed visiting. Though equally, as Taruskin plausibly speculates, Stravinsky may also have recalled his times in the Ukrainian town of Ustilug, his regular summer retreat before the First World War, where he composed several of his earlier works, and where he would have heard the itinerant klezmer bands—typically made up of violin, double bass, clarinet and drums, with perhaps a brass instrument or two. Whatever the provenance, Stravinsky’s ultimate choice of instrumental line-up echoes to a remarkable degree what is now known as Dixieland (that is, early ‘authentic’) jazz, with its prominent parts for cornet, trombone, clarinet, bass and what is effectively a single percussionist with a drum kit. The ‘interlopers’ are the violin—wholly justified as the hero’s instrument—and the bassoon, added according to Stravinsky’s curious insistence that the ensemble should be made up of complementary treble and bass instruments, the bassoon therefore paired with the clarinet. (Stravinsky later admitted he was also inspired by 'a tiny ‘bullfight’ band' he had witnessed in Seville during Holy Week, which consisted 'of a cornet, a trombone, and a bassoon'.) Yet the bassoon adds a distinctively pastoral colour that’s particularly evocative and appropriate in the melancholic ‘Pastorale’, played when the soldier realises the devil has stolen three years from his life, therefore losing his dream of married life with his sweetheart. For all Stravinsky’s remarkable genius in writing for this apparently jazz-style dance band, the number of highly skilled instrumentalists involved—seven in all, requiring in addition a conductor—was greater than Ramuz had envisaged, and reflected Stravinsky’s own lack of experience in creating an inexpensive work for touring. His demand for so many musicians largely followed from his refusal to consider using a pianist (itself a key point in Taruskin’s argument against Stravinsky’s ensemble being jazz-inspired), claiming that with so few musicians the score would appear 'like an arrangement for the piano, and that would have given evidence of a certain lack of financial means'. Ramuz, equally, appears to have been naïve about the sheer cost and amount of administration involved in putting together such a show: actors had to be auditioned and rehearsed, and scenery and costumes commissioned. With all the expense involved in preparing the show and recruiting musicians of sufficient calibre, Stravinsky and Ramuz finally abandoned their cherished idea of using a trestle stage, instead needing to sell large numbers of seats at high prices in order to recuperate their costs. Their plan therefore changed to touring in theatres in Lausanne, Winterthur, Zurich, Geneva, and other major cities and centres. The premiere was held at the Théâtre Municipal in Lausanne on 28 September 1918, conducted by Ernest Ansermet. Fears that they might fail to sell sufficient seats were only overcome when Stravinsky approached the grand duchess Helen, the former-Tsar’s cousin now living in exile in Ouchy; he persuaded her to attend—with the result that the local Russian emigrés and the diplomatic corps in Berne all flocked to the performance. However, the planned tour was brought to a halt by the outbreak of Spanish influenza; mercifully Ramuz, Ansermet and Stravinsky were merely confined to bed, but the rest of the population of Switzerland and indeed the entire world was decimated. For all the disappointment which attended the fulfilment of Ramuz and Stravinsky’s greatest project, it had been a happy collaboration for both men. Stravinsky in his autobiography recalled that it 'was the more precious to me because our friendship, growing closer and closer, helped me to bear the difficult times through which I was living'. The result, notwithstanding its distinct break from the Romantic tradition and its consciously ‘rustic’ style, is one of Stravinsky’s most emotionally candid scores—certainly one of the most exuberant and brilliantly written for its given instrumentation, as was appreciated by the musicians who gave the premiere of the Suite, held in London’s Wigmore Hall on 20 July 1920, once again conducted by Ansermet. Indeed, it was this premiere which appears to have truly launched The soldier’s tale to a wider audience and which has paved the way to a wider appreciation of this unique and unusual ‘story’ as originally envisaged by Ramuz and Stravinsky. En 1918, cinq ans après s’être fait connaître grâce à son ballet Le Sacre du Printemps, Stravinski composa une partition très différente mais tout aussi fondatrice, L’histoire du soldat. Au contraire de l’effectif orchestral imposant requis par ce ballet révolutionnaire, la nouvelle pièce était destinée à un petit ensemble de musiciens, accompagnant une «histoire lue, jouée et dansée» par une poignée d’exécutants. Ces moyens modestes étaient imposés largement par les contraintes économiques que subissait l’Europe d’après guerre, accentuées dans le cas de Stravinski par la révolution d’Octobre et la perte consécutive des biens qu’il avait en Russie. Ces restrictions lui inspirèrent pourtant une série de partitions pour ensemble de chambre particulièrement inventives et évocatrices. Stravinski collabora avec le poète et écrivain suisse Charles-Ferdinand Ramuz, dont il s’était fait un ami proche en 1915, peu après s’être installé en famille à Morges, au bord du lac Léman. Présentés l’un à l’autre par le chef d’orchestre Ernest Ansermet, Ramuz et Stravinsky furent rapidement en contact quasi permanent; avant même L’histoire du soldat, Ramuz aida Stravinski à préparer le livret français de son opéra-ballet Renard, ainsi qu’à traduire plusieurs textes populaires russes mis en musique dans Berceuses du chat et Pribaoutki. C’est semble-t-il Ramuz qui eut l’idée de créer une œuvre semi-dramatique ambulante, qui «ne comporterait que peu d’instruments et n’aurait que deux ou trois personnages» et qui pourrait être montée sur des tréteaux afin d’être présentée dans des villages dépourvus de théâtres—un moyen assez bon marché mais relativement lucratif de régler leurs problèmes d’argent. Stravinski puisa l’argument dans un conte populaire russe, Le déserteur et le Diable, publié dans la célèbre anthologie d’Alexandre Afanassiev: un soldat en permission, rentrant chez lui, est arrêté en route par le diable, lequel le persuade d’échanger son violon contre un livre magique qui lui assurera la fortune. Ramuz perçut immédiatement la portée symbolique du violon du soldat (sans parler de son potentiel musical) et, en adaptant le conte pour la scène (le transportant dans le canton de Vaud afin de lui donner un caractère «universel»), il offrit à l’instrument un rôle encore plus central: alors que dans la version d’Afanassiev le violon n’était qu’un simple moyen de divertissement pour le soldat, qui le remplaça en en achetant un autre lorsqu’il le perdit au profit du diable, dans l’adaptation de Ramuz il devient le violon, que le soldat reprend au diable en jouant aux cartes et qu’il fait ensuite résonner pour guérir la princesse. De manière significative, la fortune du soldat s’évanouit à chaque fois que le violon tombe dans les griffes du diable, et réapparaît lorsqu’il réclame son instrument: en résumé, le violon représente l’âme du soldat (comme Stravinski le confirma lui-même), ce qui souligne le caractère faustien du pacte qu’il noue avec le Diable. Pour Richard Taruskin, spécialiste réputé de la musique russe, le caractère cru si frappant de la musique créée par Stravinski pour le violon du soldat prenait source avec à-propos dans le jeu de violon du verbunkos, le style musical qui avait cours dans l’empire austro-hongrois lors des fêtes de recrutement destinées à pousser les jeunes gens à rejoindre l’armée. De manière tout aussi judicieuse, s’agissant de peindre ce simple soldat, Stravinski recourt également à un cornet, un trombone et des percussions (caisses claires et tambours notamment) pour accompagner les nombreuses marches militaires. On peut en outre reconnaître les accents des musiques en vogue à l’époque—encore qu’il s’agisse ici plus ou moins de l’histoire de l’œuf et de la poule: dans quelle mesure L’histoire du soldat est-elle inspirée par le jazz, et dans quelle mesure a-t-elle exploité par hasard un certain nombre d’influences génératrices qui ont par la suite défini le son du jazz? Stravinski déclara plus tard: «Ma connaissance du jazz provenait exclusivement de partitions [fournies par Ansermet] et … en fait je n’en avais jamais entendu en concert.» Cependant, il connaissait certainement le ragtime et ses différents avatars, qui étaient joués dans les bars américains de Paris et dans les salles de concert où il aimait se rendre. De la même manière, comme Taruskin en émet l’hypothèse plausible, Stravinski a certainement dû se rappeler ses séjours dans la ville d’Oustloug, en Ukraine, où il passait régulièrement ses étés avant guerre et composa plusieurs de ses œuvres antérieures: il a pu y entendre des orchestres klezmer itinérants—habituellement composés d’un violon, d’une contrebasse, d’une clarinette et de caisses claires ou tambours, avec éventuellement un ou deux cuivres en plus. Quelle qu’en soit l’origine, l’effectif finalement retenu par Stravinski reflète remarquablement ce que l’on appelle aujourd’hui le dixieland (c’est-à-dire le jazz «authentique» des débuts), avec ses parties prééminentes de cornet, trombone, clarinette, contrebasse et sa batterie jouée par un unique percussionniste. Les «intrus» sont le violon—dont la présence se justifie pleinement comme instrument du héros—et le basson, ajouté à l’insistance surprenante de Stravinski, qui désirait un équilibre entre instruments graves et aigus—le basson contrebalance donc la clarinette. (Stravinski admit par la suite avoir été inspiré également par un «petit orchestre de corrida» qu’il avait entendu à Séville pendant la Semaine sainte, et qui consistait en un cornet, un trombone et un basson.) Quoi qu’il en soit, le basson ajoute une couleur pastorale qui n’appartient qu’à lui et se manifeste de manière évocatrice et pertinente dans la mélancolique «Pastorale»—le morceau qui résonne lorsque le soldat se rend compte que le diable lui a volé trois ans de sa vie et qu’il a ainsi perdu tout espoir de vivre au côté de sa bien-aimée. Malgré le génie remarquable dont Stravinski a fait preuve en écrivant pour ce qui ressemble à un orchestre de danse jazz, le nombre de musiciens de haut talent requis—sept au total, sans compter le chef d’orchestre—dépassait ce que Ramuz avait envisagé et reflétait le manque d’expérience du compositeur dans l’élaboration d’une pièce peu coûteuse qui puisse tourner. Que Stravinski ait exigé un nombre d’exécutants aussi élevé s’expliquait en grande partie par son refus de recourir à un pianiste (un élément clef dans l’argumentation de Taruskin contre l’idée que l’effectif choisi ait été inspiré par le jazz). Stravinski arguait en effet qu’avec un effectif aussi réduit la partition aurait l’air «d’une réduction pour piano, ce qui eût témoigné d’une certaine indigence». De la même manière, Ramuz semble avoir été naïf quant aux coûts représentés par la préparation d’un tel spectacle: il fallait auditionner et faire répéter les acteurs, et passer commande de décors et de costumes. Étant donné toutes les dépenses impliquées par les travaux préparatoires et le recrutement de musiciens d’un niveau suffisant, Stravinski et Ramuz abandonnèrent finalement l’idée qui leur tenait à coeur d’utiliser un théâtre de tréteaux, car il était désormais nécessaire de vendre un grand nombre de places à un prix élevé pour rentrer dans leurs frais. Leur projet se transforma donc en une tournée dans des théâtres à Lausanne, Winterthur, Zurich, Genève et d’autres grandes villes. La première eut lieu au Théâtre municipal de Lausanne le 28 septembre 1918, sous la direction d’Ernest Ansermet. La crainte de ne pas réussir à vendre suffisamment de billets ne fut balayée que lorsque Stravinski sollicita la grande-duchesse Hélène, cousine de l’ancien tsar désormais exilée à Ouchy; il la persuada d’assister à la représentation, si bien que les émigrés russes du coin et le corps diplomatique en poste à Berne affluèrent à leur tour. Toutefois, l’irruption de la grippe espagnole mit un terme à la tournée envisagée; par bonheur, Ramuz, Ansermet et Stravinski s’en tirèrent en restant alités, mais le reste de la population suisse fut décimée—comme ailleurs dans le monde. Quelles que soient les désillusions qui accompagnèrent la réalisation du plus ambitieux projet de Ramuz et Stravinski, cette collaboration fut heureuse pour les deux hommes. Dans son autobiographie, Stravinsky rappelle qu’elle lui était «particulièrement précieuse, car notre amitié, de plus en plus étroite et solide, me faisait supporter avec plus de courage la dure période par laquelle je passais». Indépendamment du fait qu’elle rompt avec la tradition romantique et adopte un style délibérément «rustique», cette partition reste l’une de celles de Stravinski à l’émotion la plus sincère; c’est aussi l’une des plus exubérantes, l’une des plus brillamment écrites pour un tel instrumentarium, comme purent s’en rendre compte les musiciens qui assurèrent la création de la suite de concert, au Wigmore Hall de Londres, le 20 juillet 1920, toujours sous la direction d’Ansermet. En fait, c’est ce concert qui semble avoir véritablement fait connaître L’histoire du soldat à un plus large public, ouvrant la voie à la véritable reconnaissance de ce récit singulier, dans la forme première que lui ont donnée Ramuz et Stravinski. Ungefähr fünf Jahre nach der berüchtigten Aufführung seines Balletts Le sacre du printemps (Das Frühlingsopfer) komponierte Strawinsky 1918 ein ganz anderes, aber ebenfalls einschneidendes Werk, Die Geschichte vom Soldaten (L’histoire du soldat). Im Gegensatz zu der grandiosen Orchesteraufstellung in Strawinskys revolutionärem Ballett Frühlingsopfer sollte das neue Werk mit einer kleinen Gruppe von Musikern auskommen, die eine von ein paar Schauspielern „gelesene, gespielte und getanzte“ Geschichte begleiten. Zum Großteil waren die beschränkten Mittel das Resultat der wirtschaftlichen Notlage in Europa in den Jahren nach dem Ersten Weltkrieg. Die finanzielle Situation war für Strawinsky durch die Oktoberrevolution und den folgenden Verlust seiner Mittel in Russland besonders prekär. Aber genau diese Beschränkungen inspirierten zu einer der einfallsreichsten und ausdruckvollsten Suiten für Kammerensemble, die jemals komponiert wurde. Strawinsky arbeitete mit dem Schweizer Autoren und Dichter Charles-Ferdinand Ramuz zusammen, einem engen Freund, den Strawinsky 1915 kennenlernte, also kurz nach dem Umzug von Strawinskys Familie nach Morges am Genfersee. Nachdem Ernest Ansermet Ramuz und Strawinsky einander vorgestellt hatte, waren der Komponist und der Autor im Grunde genommen ständig im Kontakt. Schon vor der Geschichte vom Soldaten half Ramuz bei dem französischen Libretto für Strawinskys Opern-Ballett Renard (Reineke Fuchs) wie auch bei den Übersetzungen von diversen russischen Volksliedtexten, die Strawinsky in Berceuses du chat und Pribautki vertonte. Es war anscheinend Ramuz’ Idee, ein reisendes Musiktheater-Werk „für nur ein paar Instrumente und nur zwei oder drei Rollen“ zu schaffen, das man auf einer Wanderbühne zeigen konnte, um selbst Aufführungen in Dörfern ohne Theaterbau zu ermöglichen. Gleichzeitig war das eine relativ lukrative und billige Art, den finanziellen Engpass der beiden zu lösen. Strawinsky fand das russische Märchen „Der Fahnenflüchtige und der Teufel“ in Alexander Afanassjews gepriesener Sammlung. Das Märchen erzählt die Geschichte eines Soldaten, der beurlaubt nach Hause kehrt, aber von einem Teufel aufgelauert wird. Der Teufel überredet den Soldaten, ihm seine Geige gegen ein Zauberbuch zu geben, das materiellen Reichtum verspricht. Ramuz erkannte in der Geige des Soldaten sofort das symbolische Potential (von dem musikalischen einmal ganz abgesehen), und in seiner Theaterfassung des Märchens (in der er die Handlung „allgemeingültig“ in die heimische Region Waadt verlegte) gab er der Geige eine noch zentralere Rolle. Während die Geige in Afanassjews Märchen einfach nur ein zufälliges Mittel zur Unterhaltung war, die nach dem Verlust an den Teufel einfach durch Kauf einer neuen ersetzt werden konnte, wird sie in Ramuz’ Fassung die Violine, die der Soldat durch Kartenspiel vom Teufel zurückgewinnt und dann spielt, um die Prinzessin zu heilen. Bezeichnenderweise läuft die Glückssträhne des Soldaten immer dann aus, wenn die Geige in die Hände des Teufels fällt, und beginnt erneut, wenn er sein Instrument zurückgewinnt. Kurz gesagt symbolisiert die Violine die Seele des Soldaten (was auch Strawinsky selbst bestätigte) und unterstreicht damit die Faust’sche Qualität des Pakts mit dem Teufel. Die auffallend bodenständige Musik, die Strawinsky für das Violinspiel des Soldaten schuf, wurde—wie der bekannte Forscher russischer Musik Richard Taruskin behauptete—ziemlich passend von Geigern angeregt, die im Zigeunerstil Verbunkos spielten, wie er traditionell von österreichisch-ungarischen Musterungsgruppen angewandt wurde, um junge Männer für die Armee zu werben. Ebenso passend für eine Geschichte über einen gewöhnlichen Soldaten zog Strawinsky Kornett, Posaune und Trommeln zur Begleitung der verschiedenen Märsche heran. Ebenso natürlich erscheint auch der Einfluss der damaligen Unterhaltungsmusik—auch wenn wir hier vor der Frage stehen, was zuerst kam: Wurde die Geschichte vom Soldaten vom Jazz beeinflusst oder zog das Werk zufällig ein paar gängige Idiome heran, die hinterher den Jazzklang prägten? Strawinsky behauptete später: „… meine Kenntnis des Jazz kam ausschließlich von Noten [die Ansermet zur Verfügung stellte], und … ich hatte tatsächlich solche Musik niemals aufgeführt gehört.“ Strawinsky war jedoch gut mit dem Ragtime und seinen verschiedenen Nachahmungen vertraut, die in den amerikanischen Bars von Paris und in den Varieteetheatern gespielt wurden, die Strawinsky gern besuchte. Aber vielleicht war es auch so, dass sich Strawinsky—wie Taruskin nachvollziehbar spekuliert—an seine Zeit in der ukrainischen Stadt Ustilug erinnerte (der reguläre Sommersitz des Komponisten vor dem Ersten Weltkrieg), wo er mehrere frühe Werke schrieb und wo er wohl die umherziehenden Klezmerkapellen gehört haben muss, die gewöhnlich aus Violine, Kontrabass, Klarinette und Schlagzeug bestanden, möglicherweise auch noch mit einem oder zwei Blechblasinstrumenten. Ungeachtet der Herkunft der Anregungen ähnelt Strawinskys endgültige Orchesteraufstellung erstaunlich stark dem, was heute als Dixieland-Jazz (d. h. früher „authentischer“ Jazz) bekannt ist. Hier haben wir hervorstechende Stimmen für Kornett, Posaune, Klarinette, Kontrabass und ein Schlagwerk, das im Grunde wie ein Drum Kit für einen Schlagwerker aussieht. Die „Eindringlinge“ sind die Violine—völlig gerechtfertigt als das Instrument des Helden—und ein Fagott, das hier auftaucht, weil Strawinsky merkwürdigerweise auf einem Ensemble beharrte, in dem sich Instrumente im Sopran- und Bassregister gegenseitig ergänzen. Demzufolge wurde das Fagott mit der Klarinette gepaart. (Strawinsky gab später zu, dass er auch Anregungen von „einer winzigen ‘Stierkampf’-Kapelle“ empfing, die er einmal in Sevilla in der Karwoche gehört hatte und die „aus einem Kornett, einer Posaune und einem Fagott“ bestand.) Das Fagott gibt dem Ganzen jedoch eindeutig eine pastorale Färbung, die besonders ausdrucksvoll und passend in der melancholischen „Pastorale“ ist. Sie erklingt bei der Einsicht des Soldaten, dass ihm der Teufel drei Jahre seines Lebens gestohlen hat, wodurch sich der Soldat nicht wie erträumt mit seiner Geliebten verheiraten kann. Trotz Strawinskys bemerkenswertem Genie, Musik für diese angeblich jazzinspirierte Tanzkapelle zu komponieren, hielt Ramuz die Anzahl der notwendigen Berufsmusiker für zu hoch—alles in allem sieben Instrumentalisten plus ein Dirigent. Hier zeigte sich auch Strawinskys eigener Mangel an Erfahrung, ein billiges Werk für Tourneen zu schaffen. Strawinsky schrieb für so viele Musiker, weil er sich mehr oder weniger weigerte, einen Pianisten heranzuziehen (ein entscheidendes Argument in Taruskins Überlegungen gegen die Behauptung, Strawinskys Ensemble sei jazzinspiriert). Strawinsky meinte, die Partitur würde mit nur so wenigen Musikern „wie eine Bearbeitung für Klavier“ aussehen, „und das hinterlässt den Eindruck eines gewissen Mangels an finanziellen Mitteln.“ Ebenso scheint Ramuz naiv gewesen zu sein, was die schieren Kosten und den Administrationsaufwand betrifft, so eine Show auf die Beine zu stellen. Anhörproben für Schauspieler mussten durchgeführt werden, und Schauspieler mussten proben. Bühnenbild und Kostüme waren in Auftrag zu geben. Angesichts der notwendigen Kosten für die Vorbereitung der Inszenierung und für das Anheuern von Musikern von ausreichendem Format gaben Strawinsky und Ramuz letztlich ihre geliebte Idee auf, eine Wanderbühne zu nutzen. Stattdessen begriffen sie, dass sie eine große Anzahl von Plätzen zu hohen Preisen verkaufen mussten, um ihre Kosten zu decken. Deshalb sah der geänderte Tourneeplan nun Auftritte in Theatern von Lausanne, Winterthur, Zürich, Genf und anderen großen Städten und Zentren vor. Die Uraufführung fand im Théâtre Municipal in Lausanne an 28. September 1918 unter der Leitung von Ernest Ansermet statt. Aus Angst, nicht genug Plätze zu verkaufen, sprach Strawinsky die Großfürstin Jelena an, die zu diesem Zeitpunkt im Exil in Ouchy lebende Kusine des ehemaligen Zaren. Strawinsky überredete sie, sich das Werk anzusehen, was dazu führte, dass sich die hiesigen russischen Auswanderer und das diplomatische Korps in Bern zu den Vorstellungen drängten. Die geplante Tournee kam jedoch durch den Ausbruch der Spanischen Grippe zu einem unerwarteten Halt. Glücklicherweise waren Ramuz, Ansermet und Strawinsky nur zur Bettruhe verurteilt, die Bevölkerungszahl der Schweiz und sogar der gesamten Welt erlitt erhebliche Einbußen. Ramuz und Strawinsky mögen zahlreiche Enttäuschungen bei der Verfolgung ihres größten Plans erlebt haben, ihre Zusammenarbeit war jedoch für beide Männer erfreulich. Strawinsky erinnerte sich in seiner Autobiographie, dass diese Kooperation „aufgrund unserer immer enger werdenden Freundschaft besonders wertvoll war und mir half, die schwierigen Zeiten zu ertragen, in denen ich lebte.“ Das Resultat ist eine der emotional offensten Partituren Strawinskys, auch wenn sie deutlich mit der Romantik bricht und einen bewusst „rustikalen“ Ton anschlägt. Sie zählt sicher zu den ausgelassensten Partituren und zeigt, wie man die gegebene Instrumentation auf beste Weise nutzen kann. Das wussten die Musiker zu schätzen, die die Uraufführung der Suite spielten, die am 20. Juli 1920 in der Londoner Wigmore Hall stattfand, wiederum unter der Leitung von Ansermet. Tatsächlich war es wohl diese Uraufführung, die Die Geschichte vom Soldaten einem breiten Publikum zugänglich machte und den Weg für eine umfangreichere Rezeption dieser einzigartigen und ungewöhnlichen „Geschichte“ ebnete, so wie sich das Ramuz und Strawinsky ursprünglich einmal vorgestellt hatten. Part 1 No 3: The soldier's march (reprise) – The soldier returns to his homeland Hurray, here we are! Part 1 No 4: Music for scene 2: Pastorale Ah! You dirty cheat, it's you! Part 1 No 5: Airs by a stream (reprise) – The soldier remembers Please, kind sir, can I come in?